Oh yes, the Roman Ox Cart, even after Marius reformed the army - he had each soldier carry several days food with all his impedimenta - the army still needed to be resupplied on campaign by hundreds of Ox carts and Mule trains. 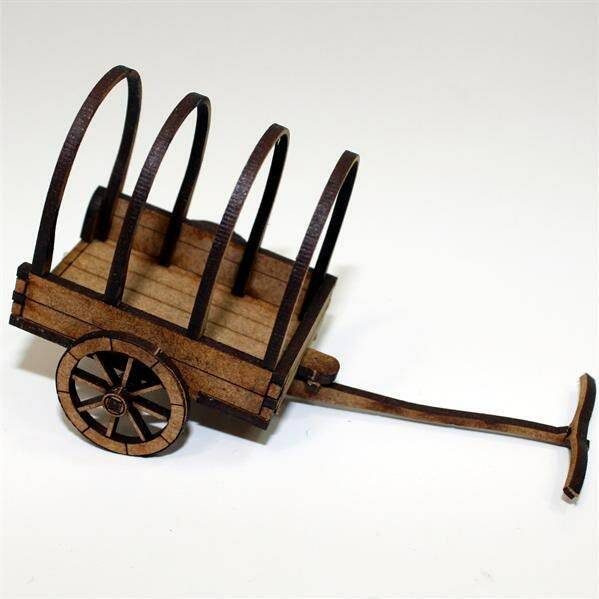 Romans needed carts to last; they forged iron rims to their wheels so they would last longer on their roads. Iron forged rims would not be made again in the same way for over a thousand years after this technology was lost in the Dark Ages. It can be made either with a hooped canopy or an open top. 28mm Scale model supplied unassembled and unpainted. Oxen and Romans not included. Material is compressed cardboard and comes pre-colored but further modifications may be necessary for best effect.